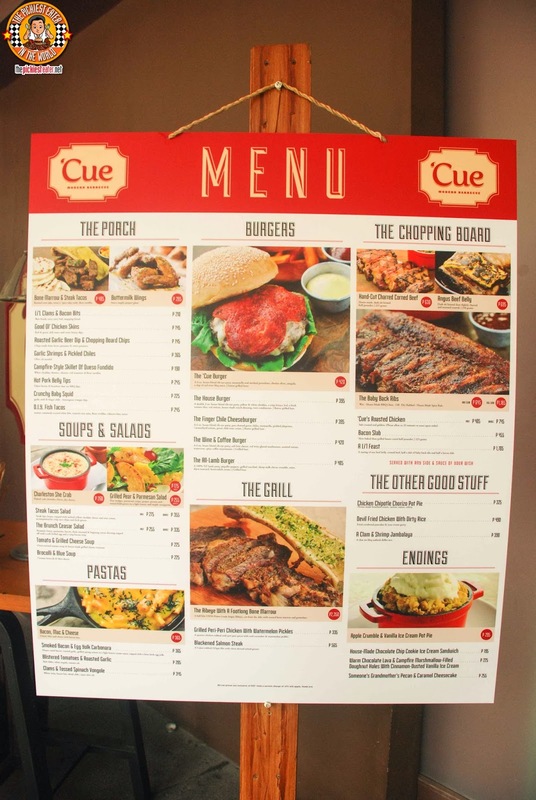 THE PICKIEST EATER IN THE WORLD: 'CUE MODERN BARBECUE'S NEW PORCH MENU! The Porch menu was conceptualized by Enzo Lim, the man behind Maharlika and Jeepney - successful Pinoy restaurants in New York. 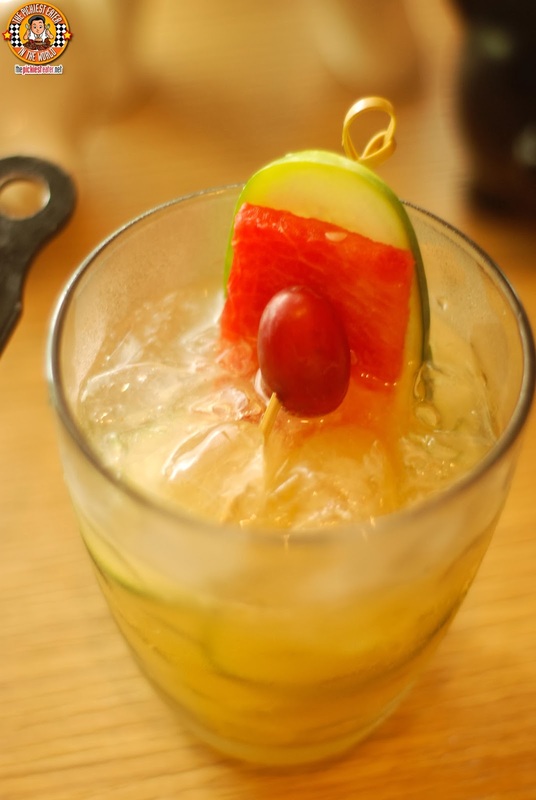 Chef Enzo used his bartending skills to craft these cocktails that perfectly match the delicious appetizers of 'Cue. The first cocktail they brought out was the Patio Cooler (P225) which is Beefeater Gin with an Assortment of fruits, vegetables and spices. 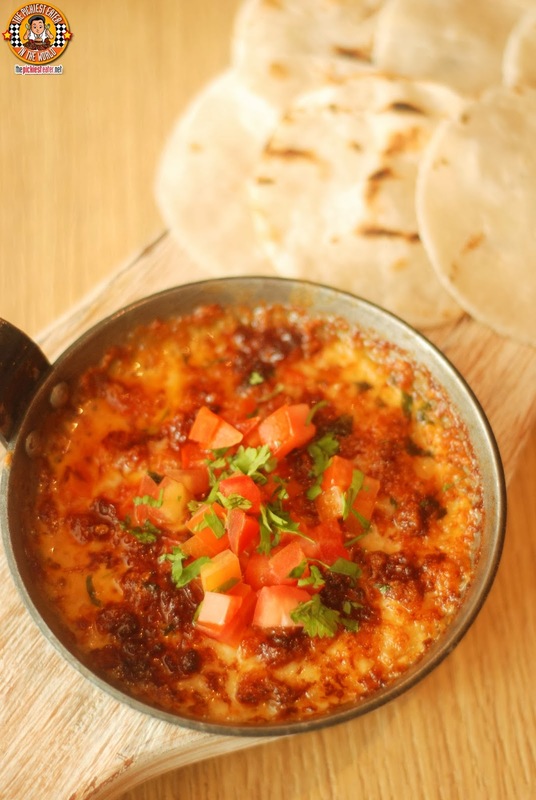 The punches of flavor from the Patio Cooler pairs well with the Campfire Style Skillet of Queso Fundido (P190). I enjoyed the richness of the White Cheddar that melted beautifully into the minced chorizo, and cilantro (I had to skip the tomatoes). I scooped up a generous helping and smeared it on the warm flour tortilla, and it went right into my mouth. 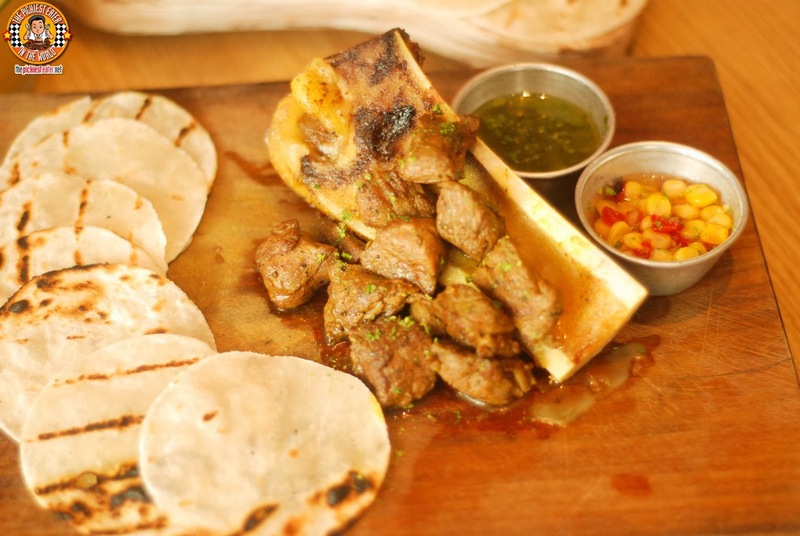 Another item that pairs with the Patio cooler is the Bone Marrow & Steak Tacos (P485) - the dish that made me hop into my car and drive to Bonifacio High Street and head off to 'Cue. The cuts of steak were juicy, and the marrow was rich, but balanced nicely by the roasted corn salsa and sweet and spicy salsa verde. The next concoction of Chef Enzo that we tasted was the Pitmaster's Pick (P205). 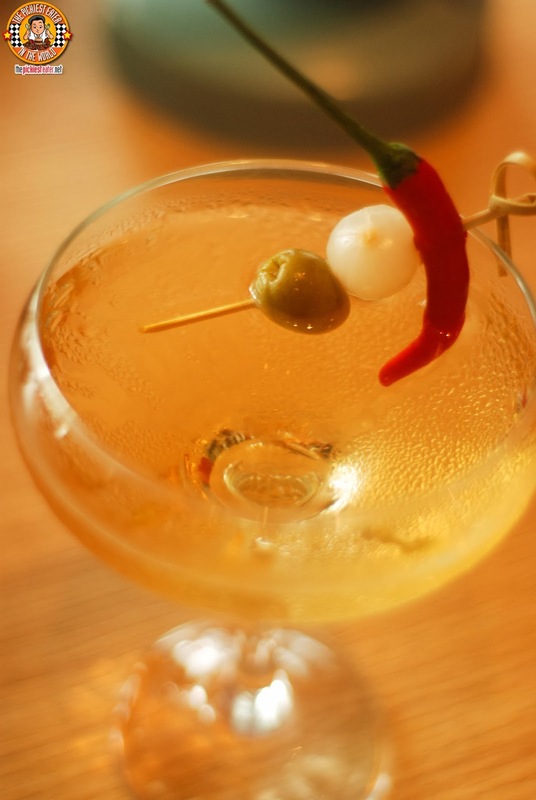 This is made with Russian Vodka or English Gin Martini, Cue's House Brine, Olives, Pickles and for a local touch, Filipino Chili. It was weird because this was the first time I tried a alcoholic beverage that actually tasted savory. 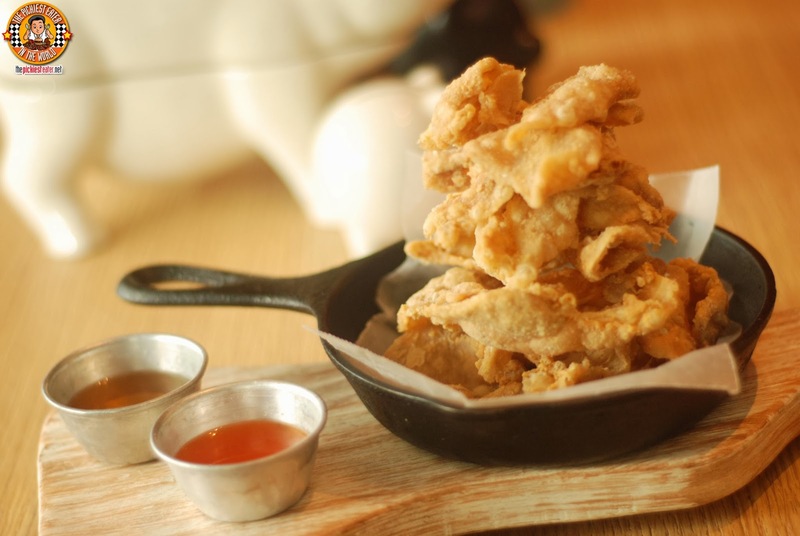 This is paired with 'Cue's Good Ol' Chicken Skins (P145). 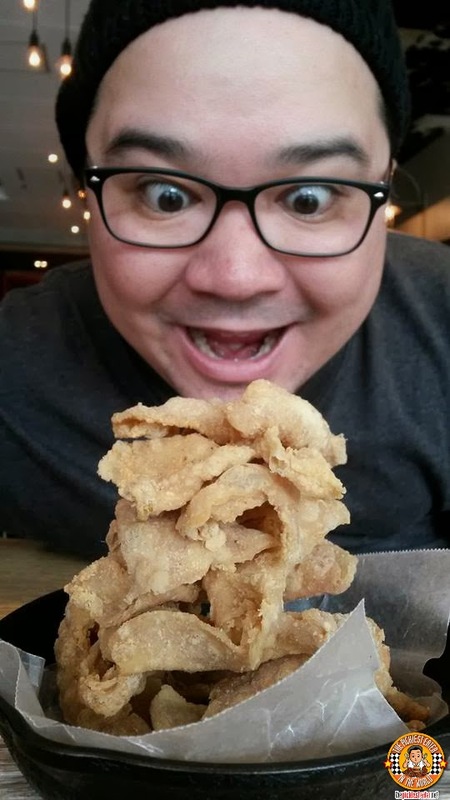 The skins are coated in a light breading before deep fried to golden perfection. It was amazing to see the skin reach an incredible level of crispiness, without becoming too greasy. The Skins itself, admittedly, didn't pack a wallop of flavor to it. But what it did provide, was a good base for the red and green chili dip, or in my case, the sweet honey dip. It was no surprise to Rina that I let out a little sigh of admiration when they brought out the Hot Pork Belly Tips (P245). 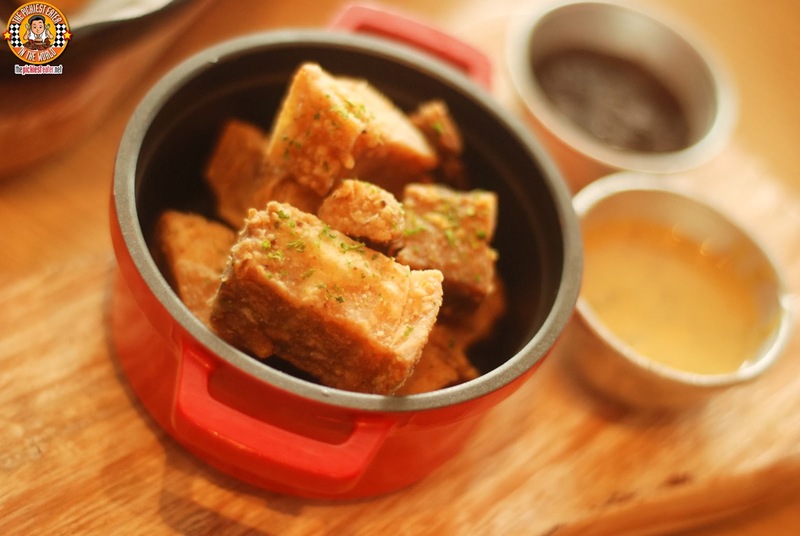 Little bits of chopped and breaded pork belly also fried to perfection, and served with a side of a choice of Dijoun Honey or Char siu BBQ Dips. Next up was the Bonifacio Sour (P295), which was made with Buffalo Trace Bourbon, lemon, calamansi, egg white and Red Wine Float. Kinda weird hearing that there's egg white in a drink, but I know nothing about alcohol, so this could very well be normal for all I know. 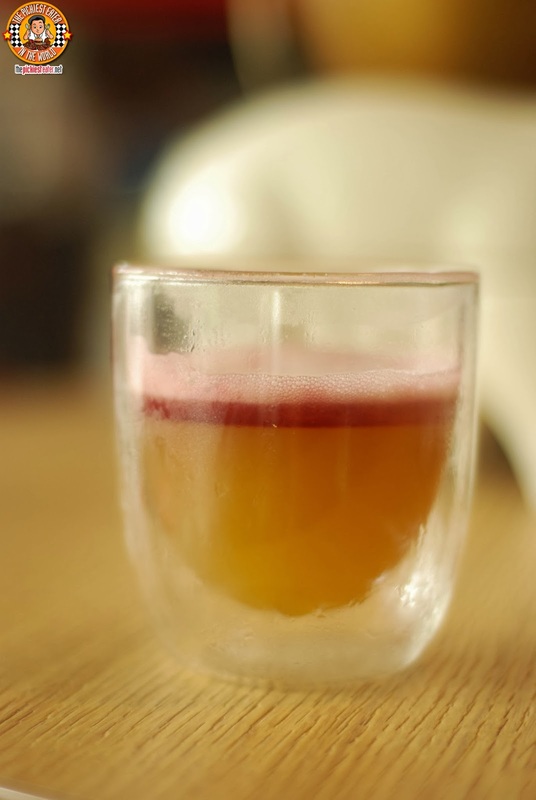 The Bonifacio Sour is best paired with the Buttermilk Wings (P285). 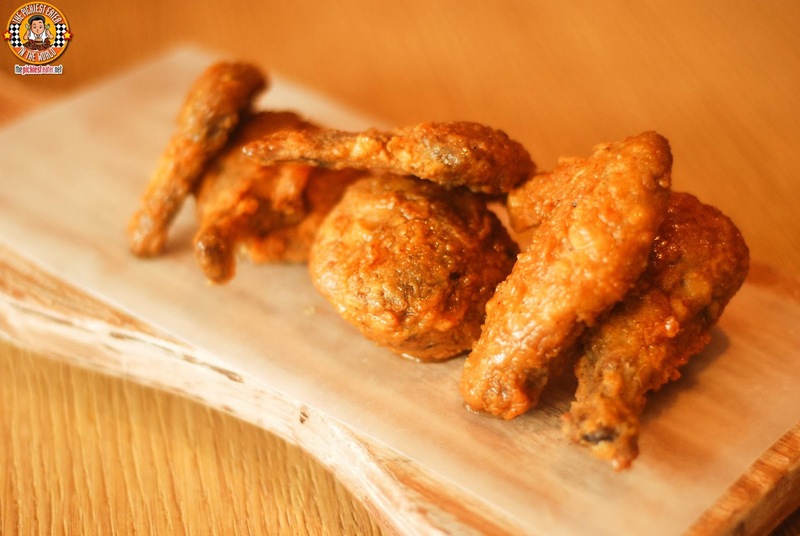 The fried wings are coated in a stunning Maple Pepper Glaze that offers a gorgeous crunch with every bite. 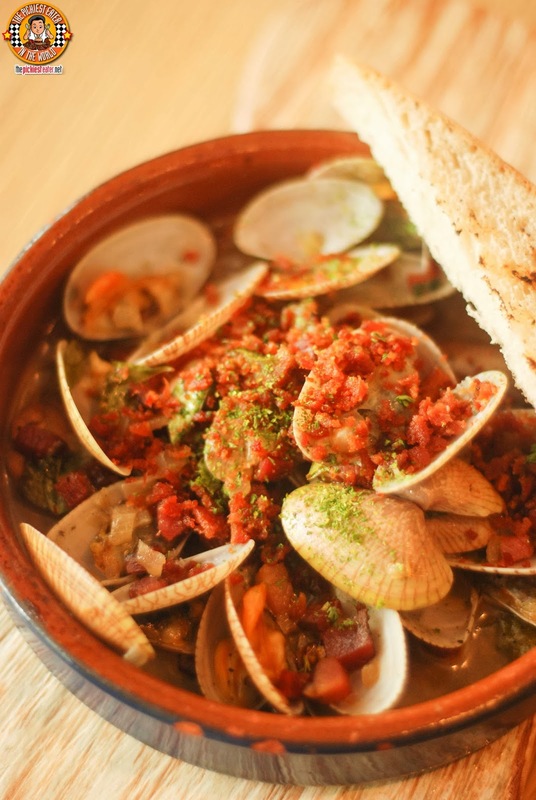 Another dish that pairs well with the Bonifacio Sour is the Li'l Clams and Bacon Bits (P210). The Clams are drowned in 'Cue's Beer Broth, topped with a generous helping of crumbled bacon, and a bit of Torn Curry Leaf and a side of Mopping Bread. 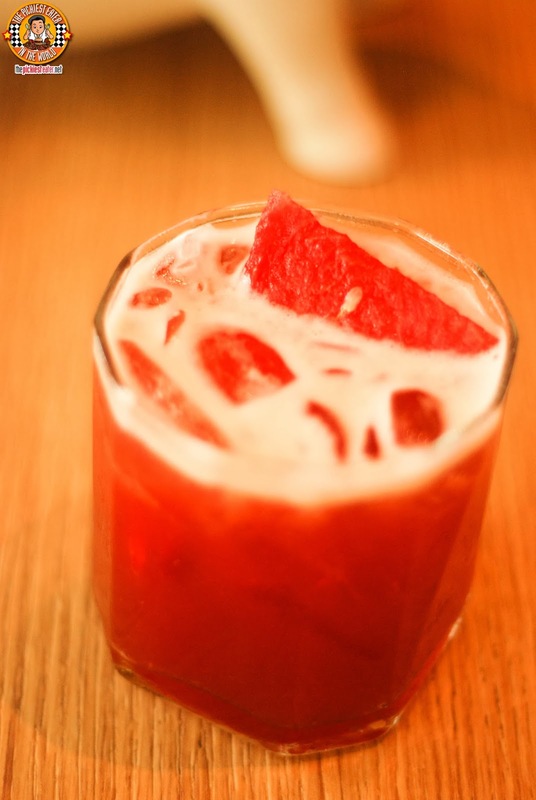 The final drink for us to taste was the Sweet Soul Picnic (P225) which was concoted using Sauza Tequila Gold, Watermelon, cardamon-agave and fernet branca. Though I really don't drink, this was the refreshing fruitiness of the Watermelon made this drink the one I enjoyed the most, by far. This was paired with 'Cue's DIY Fish Tacos, which was perfectly cooked white fish, encased in a sesame cornmeal coating, served with a side of Roasted Corn Salsa, and a Cilantro-Lime Tartar. The other dish that was paired with the Sweet Soul Picnic, was the Crunchy Baby Squid (P225). 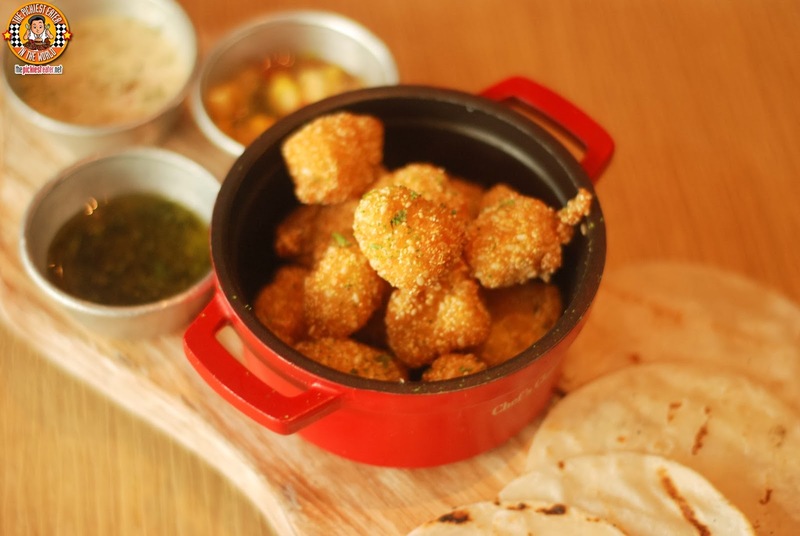 Breaded pieces of Baby Squid, fried to a nice crunch, served with a garlic aioli with finger chile and a lemongrass vinegar dip. I don't eat squid, but this seemed to be a hit with the group. 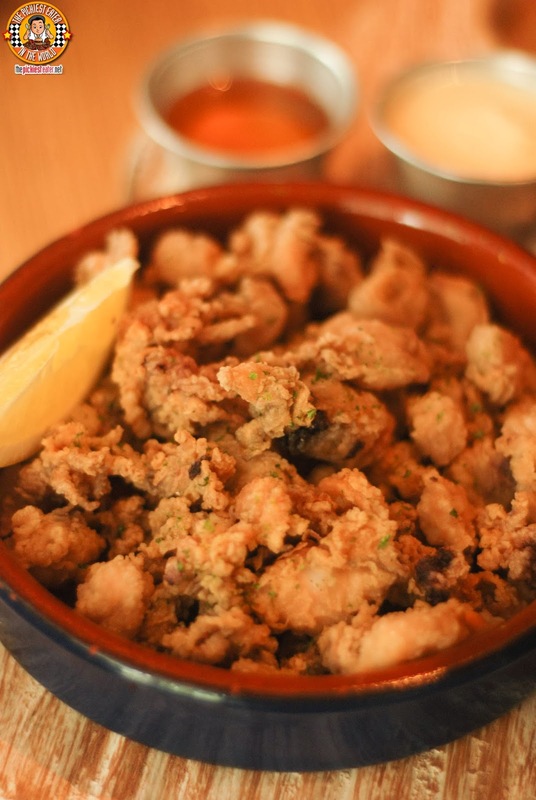 Though we only had tapas style dishes, our bellies were very much content. I told our hosts that I couldn't even THINK about having dessert anymore. So I heard them tell the waiter, "Ok, please cancel the Apple Crumble and Vanilla Ice Cream Pot Pie.". Ok, hold the phone. No one said anything about Apple Crumble and Vanilla Ice Cream Pot Pie. Our hosts must have seen the look of regret on my face when they were cancelling our order, because after whispering something to the waiter, he nonchalantly came back with the glorious dessert. 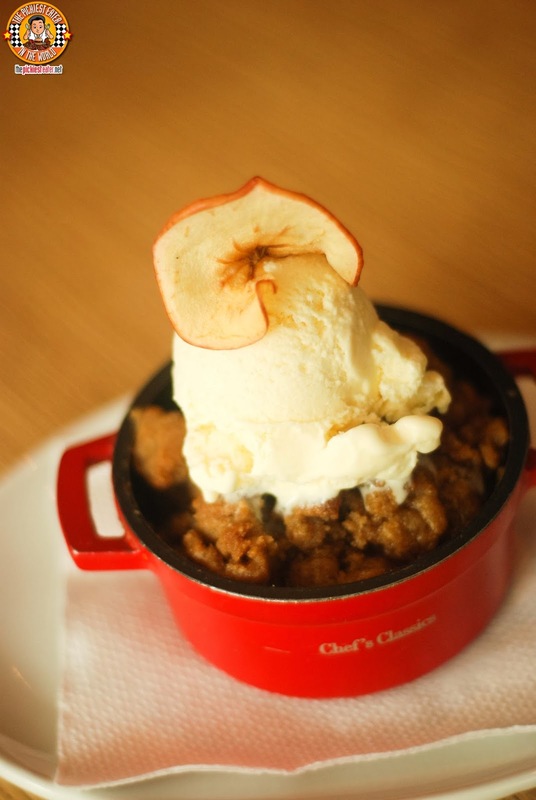 The apple crumble itself was wonderful. A mixture of a nice crunch, cohesively mixed with sweetened apples whose tartness is tempered by the scoop of whipped cream. 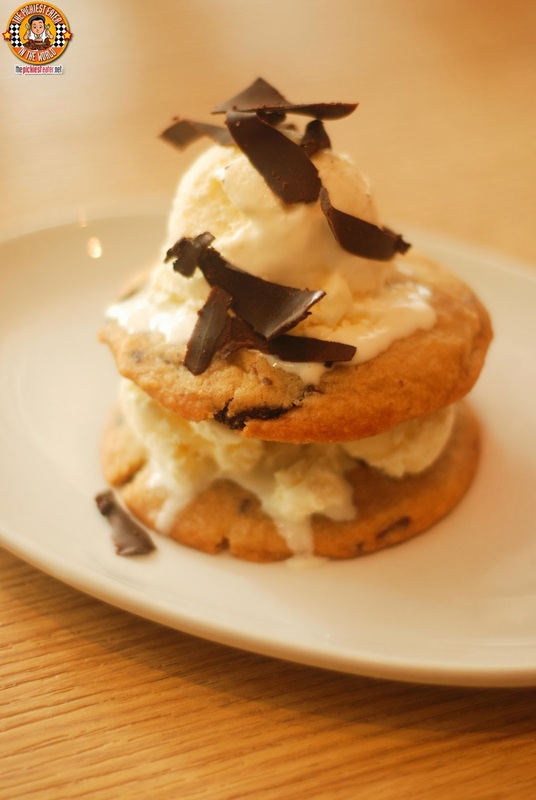 Our hosts must have realized that I was lying when I said I couldn't possibly have dessert, so they decided to rub it in my face some more by bringing out the House Made Chocolate Chip Cookie Sandwich (P295). If you're around my age, then you must remember the Eskimo Roll of Coney Island. If you remember that, then your spider sense tingles every time someone mentions a chocolate chip cookie sandwich. 'Cue's version is quite delicious, had a nice crisp exterior which gave way to some gooey chocolate chips, that go perfectly with the vanilla ice cream toppping. Even after just one visit, 'Cue really left a mark on me, with its mastery of BBQ Meat. After my second visit, where I got an in-depth taste of their Porch Menu, and exploring it further with a drink pairing, it only reaffirmed for me that 'Cue is one of my favorite restaurants in the metro. I want to go back really soon as well!